The GPU standards have been changing at a faster rate than one could ever imagine. Are you confused about the memory standards used in the GPUs today? Well, you are not alone. Both GPUs and faster VRAM play an essential role in all those GPU intensive tasks that your computer handle day in and day out with your workloads. Graphics cards require ultra-fast, point-to-point low latency VRAM and multi-core GPU for a good level of performance, adequately needed in today’s standards. So, how do the GDDR5 vs GDDR5X perform in comparison to one another? Read along to know more! Related: GDDR5 vs GDDR6 – What is The Difference? The GPU or graphics processing units are programmable logic chips that work as the primary resources for the visual functions on your device. The graphics memory sub-system plays a significant role in the overall performance of your devices and thus need to be chosen with utmost care. Most of the widely used graphics processor currently use to a reasonable extent is GDDR5. However, it is being replaced by the GDDR5X and GDDR6. For the sake of this post, we will compare the GDDR5 and GDDR5X for a clear understanding of the concept. The GDDDR5 has been around for more than ten years and perhaps going quite stable over the years. It has been one of the prominent high-end low latency graphics card memory standard for all your requirements. The GDDR5 has indeed been one of the industries prominent choices in terms of fastest graphics cards memory. Almost all graphics card manufacturers have been employing this technology. The card has essential features that would make it an excellent choice for high bandwidth memory performance. Additionally, the low power requirement would make it an excellent choice for optimal power consumption levels. Offering you speeds up to 9 Gbps. The memory standard is utilized in the top end graphic cards like GTX 1060, GTX 1070 and Radeon RX 480. The GDDR5X is the next evolutionary step after GDDR5. It offers you speeds ranging up to 14 Gbps. It can be one of the best options for the best high-performance graphics cards. The GDDR5X is twice as faster as the GDDR5 as indicated in the table here below. While the standard has been offering the high transfer speeds in the range of 10 to 14 Gbps performance, the next iterations of the technology have been expected to bring in a rate of 16 Gbps post lithography process optimization and better yields. As things stand as of now, the memory cards with the GDDR5X standard have been explicitly designed by Micron. Even when the market is witnessing the new standards like HBM, the GDDR5 and GDDR5X have been taking up a massive lead over these new technologies. The GDDR5X is found in the graphics cards like GeForce GTX 1080 and Nvidia TITAN X. You will also see the GDDR5X memory standard in the high-end work station graphic cards like Nvidia Quadro P5000 and Quadro P6000. Please note that you will not be able to replace the older GDDR5 based memory cards with the GDDR5X cards on a PC. The reason is evident – the GDDR5 comes with a 170 pin connection, while the GDDR5X offers you connectivity with 190 pins. The table above should give you a clear understanding of the best features of both the variants of memory standards. In almost all aspects, you will find that the GDDR5X is better placed in comparison to the GDDR5. The bandwidth availability, clock speed, and power consumptions are the areas that the GDDR5X excels in its performance. However, if you are looking at the ready availability and pricing, they can be a little less impressive in comparison. The GDDR5X is available in higher sizes in comparison to the GDDR5. 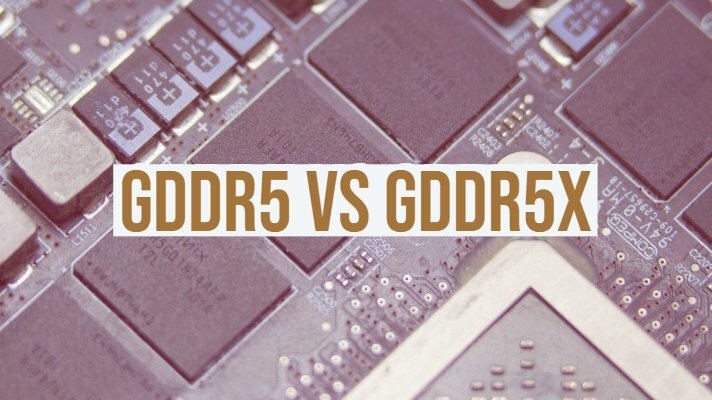 In fact, given the case where newer standards are making way for the next range of graphics cards and memory technology, it may be a good idea to check out the usability and other details of GDDR6 and HBM. Nvidia has been opting for the GDDR5X for its latest range of graphics cards. This fact is indicative from the launch of the newest GTX 1080 and Titan X which employ GDDR5X memory standard. Possibly, Nvidia will continue to have the same standard continued for a considerable period. However, AMD is opting for the HBM technology for its graphics cards. In any case, we would expect GDDR5 and GDDR5X to continue for a reasonably good deal of time. Well, if you are looking ahead to a comparison that lists the highs and lows of each of the memory standards, we must say this is not definitely about one-upmanship. All those memories have been built with a high degree of performance. The GDDR5 is a relatively older standard, but quite powerful enough at that. The rest of the standards – including the ones we have not discussed here (like HBM, HBM2, and GDDR6) are even faster per Watt. Have you used any of the graphics cards with the memory standards GDDR5 and GDDR5X? If yes, you can share your thoughts and inputs with us.